Inspire – Get someone interested in joining the community. Provide Opportunities – Find something for them to do. Review – Review their work to help them be successful and have their work included. For each of these areas we perform different types of work. As an example, to inspire people to contribute we perform lots of outreach, run education weeks, and try to showcase great work. For the opportunities side of things we run bitesize bugs campaigns and more. We also strive to ensure that contributions are reviewed in a timely manner. We have though found two distinctive challenges in defining opportunities and reviewing work. First, in terms of opportunities, the bitesize bugs lists, lists of QA tests to complete etc, are often changing and growing and sometimes new contributors don’t see these new additions. Also, in terms of reviews, we have sometimes seen the queues of content that needs to be reviewed (e.g. the Ubuntu Sponsorship Queue and various merge proposals) build up because our reviewers get busy with other work and forget about the reviews. This is a problem with visibility of lists. We want to always ensure that lists of opportunities and reviews are very visible to new contributors for the former and our existing mentors for the latter. Traditionally this has been a challenge as the lists and their visibility has always existed on a website and are not locked into the daily workflow of those respective groups (new contributors and mentors). Fortunately, I think technology could help with this. Much of the work we have done in growing our community has happened outside of an installed Ubuntu system. The work happens on websites, in calendars, in social media and elsewhere. I have though always been curious about how we could build community interaction directly into an Ubuntu desktop. I wrote Lernid as an experiment in to this: providing a cohesive application that brought together the different pieces in delivering a solid online learning experience, and the application has proved to be popular. In thinking about our problem of raising the visibility of lists, it struck me that we have this awesome application indicator technology that we ship with every Ubuntu desktop, and this could help significantly. Imagine we had an indicator for different types of participation, and it always provided a set of links that were tuned to you and your capabilities. Let’s look at a few examples. You are a developer on a project (e.g. Unity), and you want to always provide timely input on merge proposals. The indicator-codereview indicator would present code reviews for all the projects you have permissions to review code for in Launchpad. 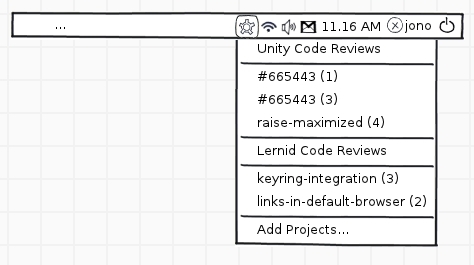 If you click on one of these items it would take you to the merge proposal page for that branch in Launchpad. You are interested in testing Ubuntu for the current development release. The testing process should be as simple as installing indicator-testing which then presents a list of tests that are appropriate to your software and hardware configuration. As an example, if you have an ATI card it would show tests relating to your card and driver. Clicking on each item would load a checkbox type test that would take you through the steps of testing and uploading the results back to the testing team. This indicator would regularly poll a back-end testing service to update the list with new items when you have completed the tests. The indicator would change color to indicate that there is new content. The Ubuntu Sponsorship Queue is a key piece in how we grow our developer community. The indicator-ubuntusponsorship indicator would provide a list of items on the queue potentially that are related to the packages you are interesting in in the queue. Clicking on each item would take you to the item in Launchpad. I think these indicator features could really help raise the visibility for different opportunities and reviews open to our community, and embedding the community experience more deeply into the desktop. Documentation – some details and code snippets of how to write an indicator. Get Help – #ayatana on freenode and the mailing list are there to help. Great idea to integrate these important social function into ubuntu, is way better to stay always in your favorite browser and change every time windows; in this way we can reduce time and simplify the connection between community and developers. Ted, do you think it might make sense to pull that out into a different individual indicator? I just worry about the messaging menu filling up with too much content and also providing features to easily select which projects you want to see reviews for. Perhaps, but I think there’s also a clear argument that indicators are being heavily overused (and I was say abused) when they should be integrated with the messaging menu instead. Yes. Separate indicators is a slippery slope back to the bad days of piles and piles of systray icons. I think it is only a slippery slope if they don’t serve a purpose. With this idea you would install an indicator for different types of participation. Well, the messaging menu is an indicator too, I see your point though.